Whipped up (or should that be tossed up??) this salad tonight to go with a simple seared Tuna steak. Adapted from Cuisine with a few short cuts thrown in it had us both fighting for the last bits on the plate...not a bad result for a salad! Place garlic, sprinkle of sea salt & crack of pepper, pine nuts, lemon juice, olive oil and half the parmesan cheese in a narrow bowl or jug and whizz with a hand held or wand mixer until everything is mixed. Make sure the pine nuts are all chopped up, add more oil if dressing is too thick but I prefer it thicker rather than runny. Set aside in the fridge. Prepare the salad - cook asparagus in salted boiling for about a minute, drain then blanch in cold water. When cooled sliced in half down the middle. 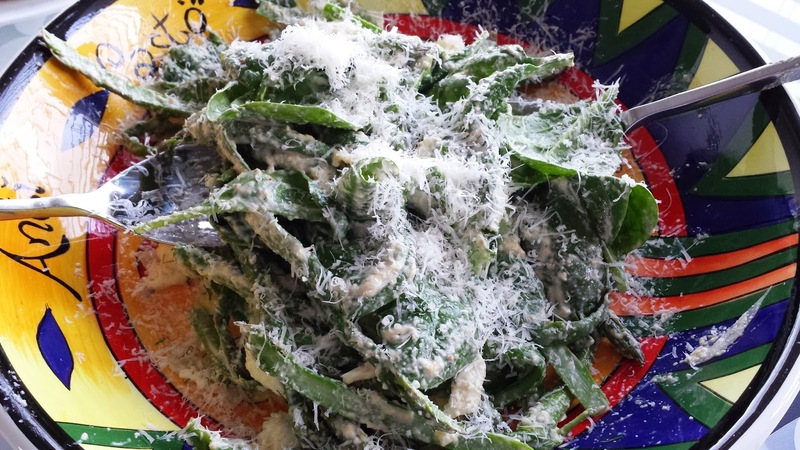 Place into a large salad bowl along with the thinly sliced fennel, baby spinach and bocconcini. Pour over dressing, sprinkle over rest of the grated parmesan cheese and enjoy!